This modern luxury cruiser was especially designed for the deeper waters of Lake Nasser MS Nubian Sea has style, charm & character and offers first class comfort. There's a relaxed atmosphere in the elegant restaurant where guests can select from varied buffets of seafood, local and International cuisine, which are freshly prepared and stylishly presented. 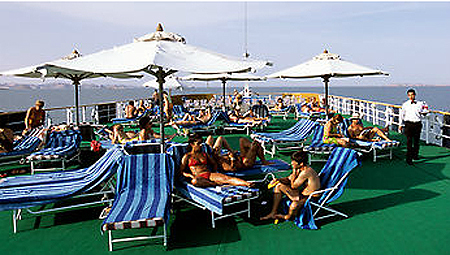 The pool and sundeck area is well appointed being situated towards the front of the cruiser. With ever changing panoramic views, the sundeck is ideal for those who wish to do nothing more than soak up the sun. For those who wish to escape the midday sun a covered outside restaurant beckons, with friendly staff ready to serve beverages whilst you survey the dramatic landscape of Lake Nasser. The cruise is fully escorted by an English speaking, fully qualified Egyptologist who will be on hand throughout your cruise and who will, also, accompany you to all the fascinating sites given on your itinerary. 66 cabins including suites with air-conditioning, shower en-suite facilities, internal telephone and radio. Many travellers have been fascinated by the sights, sounds & ancient monuments along the banks of the River Nile. With the construction of the High Dam at Aswan, Lake Nasser brings another dimension to cruising and offers visitors the opportunity to explore lesser known temples and experience thousands of years of Nubian history in a unique style. Day 1 - Embark cruiser before lunch. Afternoon free. Dinner and overnight on board. Day 2 - Morning visit to the Temple of Kalabsha - dedicated to the Nubian God Mandulis and the Temple of Beit el Wali - House of the Holy Man - which was carved from rocks during the reign of Ramses ll. After lunch sail to Wadi el Seboua. Dinner and overnight on board. Day 3 - Morning visit to Wadi el Seboua temple entered through an avenue of sphinxes, the temple of Dakka dedicated to the god of Wisdom, Thoth of Pnubs and the ruins of the temple of Maharakka. Lunch on board. Sail to Amada to visit the oldest monument on Lake Nasser the temple of Amada. Also visit the Derr Rock Temple built by Ramses ll dedicated to the rising sun and finally visit the tomb of Pennut. Dinner and overnight on board. Day 4 - Morning sailing to Kasr Ibrim for a visit from the lake to see this Nubian monument, which is situated on the original site, surrounded by water. Sail onto Abu Simbel where the great temple of Ramses 11 appears to be rising from the depths of lake. Carved into the mountain and dedicated to Ra-Harakhty, Amun, Ptah. Also visit the temple of Nefetari, the beloved wife of Ramses ll. Day 5 - Opportunity to visit Abu Simbel for a second visit. Breakfast and disembark.